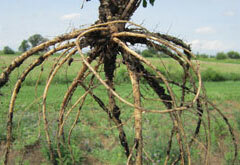 Has a lateral branch root that grows well in lowland conditions and variable soils. Shockwave BR has a high resistance to heaving. Available for use in fields with more variability or heavier clay. The roots can branch out if they encounter wetter conditions that would affect the long term survivability of most tap root varieties. This variety will help to maintain alfalfa longer in the field but will not grow where water pools for long periods of time or is just not suitable for alfalfa in general. Sunken Crown to protect from close grazing and wheel traffic. Used for hay or pasture. A persistent tap rooted alfalfa. Good winter hardiness and persistence. An economical and dependable blend of 4 different alfalfas suited for success across a variety of conditions and geographies. Blended by Speare Seeds, Merit Brand Alfalfa provides an excellent combination of multifoliate expression, high forage yield and a branch rooted variety to tolerate variable soils. A great choice for multi-cut haylage systems. Early maturity, excellent disease resistance, fast regrowth and winter survival combine for high yielding, consistent production. A multifoliate variety with a tap root. 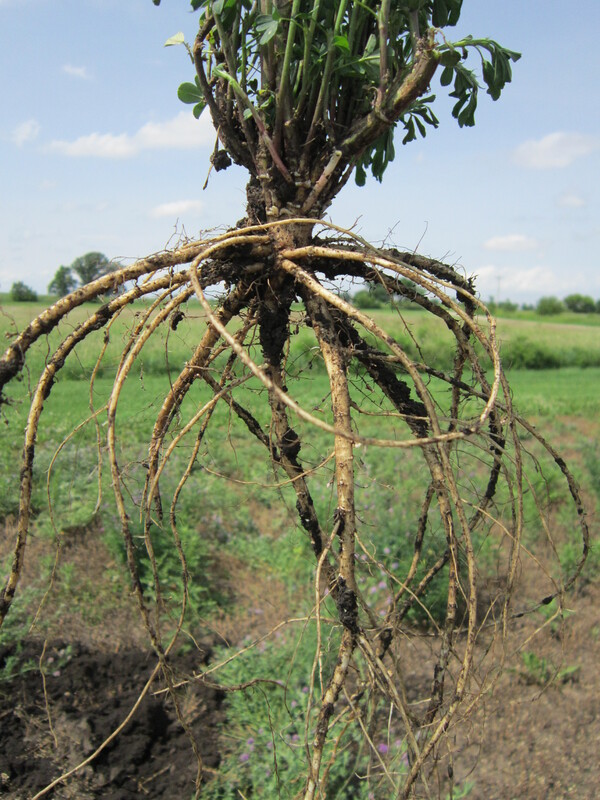 A branch rooted alfalfa that can perform better than conventional varieties on heavier soils or imperfectly drained sites. Medium maturity, excellent disease resistance and winter survival make for a durable, long lasting stand. Nitrogen-fixing bacteria for alfalfa and sweet clover. OMRI listed. A non-bloating legume used in Western Canada for hay or pasture. Early to start growth in the spring, matures earlier than alfalfa and is slower to regrow. Seedlings are not very competitive and require a year to get established before grazing begins. Best adapted to well drained soils. Difficult to get the proper inoculant for sainfoin. *Please note: Alfalfa inoculant will be shipped with all orders of straight alfalfa at an additional cost. Earliest of the timothys. Well adapted to Ontario conditions. High yielding, early maturing timothy with good tolerance to waterlogged soils. Extremely leafy. Adapted to cool, moist areas. Proven late maturing timothy. Well adapted to varying soils and moisture conditions. Late maturing, high yielding and improved summer performance. Easy to establish, fast regrowth, excellent winter hardiness and superior persistence for forage production. Can be grown in fields too wet or acidic for alfalfa. Longer persistence than common Double Cut Red Clover. Short-lived perennial legume used primarily for hay, haylage and plowdown. Red Clover is a bloating legume; use with caution in a pasture mix. Short-lived, late maturing, bi-annual legume with high nitrogen fixing potential. A short lived, high nitrogen producing crop designed for frost seeding into winter wheat or underseeding into mixed grain. The deep rooted Single Cut mixed with the vigorous top growth produced by the Double Cut makes a perfect plough down crop. Especially well adapted to cool climates and wet soils. Does well on soils that are too acidic for red clover and tolerates more alkalinity than most other clovers. Excellent winter hardiness. Fits shorter-term stands. Flood tolerance 7-14 days. DO NOT feed alsike clover to horses. 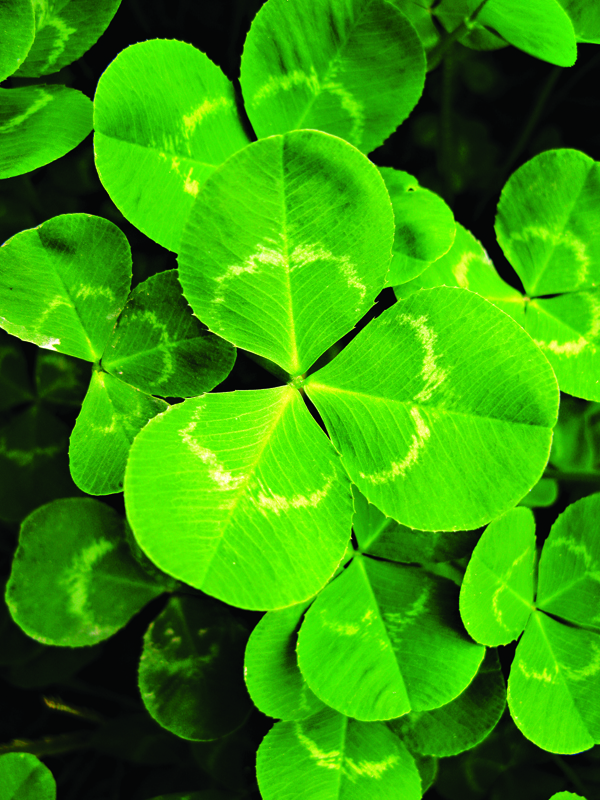 An annual clover that is best used for haylage or grazing. It has a low risk of bloat and can be cut or grazed multiple times throughout the season. Frosty has a high cold tolerance and can survive down to -15° C. Planting in mid-spring to early summer to get the most growth throughout the year is ideal. Oats make a good companion species for feed. Frosty can also be added to a cover crop mix being planted in early summer. Will tolerate waterlogged soils better than alfalfa. Frosty is coated and pre-inoculated. Usually planted in the late summer. Can be used in pasture, hay, organic farming, pollinator enhancement, silage mixes, as a winter cover for soil protection or green manure crop for soil improvement. Mainly used for plowdown with its deep taproot. A bi-annual species. More heat and drought resistant than alfalfa. Excellent source of nectar and pollen for bees. Combines the persistence of dwarf white clover with the large broad leaf and yield potential of the taller Ladino types. A good addition to pasture mixes. Tall growing, branch rooted, high yielding, winter-hardy variety. Branched root secures the plant in the ground to prevent heaving when freezing and thawing occur. Best used in hay mixes. Use in hay pasture and ground cover mixes. Shorter growing white clover. White Clover is a persistent shorter growing clover that is commonly used in long term pasture blends as it will reseed itself and is adapted to intense low grazing. It is also utilized for ground cover, weed suppression and overseeding into thinning pastures to improve forage yields and quality. A small seeded annual that can be used for forage or as a cover crop. FIXatioN can tolerate a wide range of soil types and growing conditions; it is known to withstand very cold temperatures. Quick to germinate, and then top growth slows as it begins to form a rosette and deep tap root. Works best if allowed to over winter and can produce large amounts of nitrogen. FIXatioN can be used to overseed hay or pasture fields to extend their life. Also works well in wildlife and pollinator mixes. FIXatioN is coated and pre-inoculated. Nitrogen-fixing bacteria for red clover. Not OMRI listed. 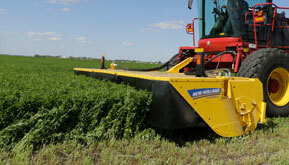 Bloat resistant legume for both pastures and hay production. High yielding variety with good seed quality and vigour. Excellent winter hardiness and works well in horse hay mixtures with 3-4 year stand life. Excellent pasture grass having a bunch-type growth habit, reproduces by tillering. More suited to grazing than smooth bromegrass because of its faster regrowth. High yielding and one of the most winter hardy bromegrasses that will spread over time with rhizomes. An excellent choice for long term hayfields in southern and northern Ontario. High yielding with good seed quality and vigour. Works well for 3 year stands in southern Ontario. Seed is clipped for easier planting. Economical and winter hardy bromegrass for hay that will stay palatable when mature. Long term stand that will spread over time by rhizomes. Late maturing variety with quick spring re-growth. An excellent choice to plant with alfalfa. High yielding. Excellent disease resistant, late maturing varieties have been chosen for this blend. Aggressive grass for early hay or pasture. Will persist on moderately, drained soils. Endophyte free cultivar - soft leafed, very palatable, late maturing and highly digestible - very dense and persistent. Tolerant of moist conditions, best for grazing. A blend of late maturing, soft-leaf tall fescues that works great for hay or silage. Highly digestible and works well in mixes with legumes and other grasses. Late maturing festulolium variety developed for better persistence. Winter-hardy and highly palatable. Also exhibits excellent rust resistance and performs well in heavier soils. Safe for horses. Meadow fescue and tall fescue mix that is well suited for use in T.M.R. rations. Can be planted alone (25 lbs. / acre) or in a mix with alfalfa. A thin stemmed variety with quick regrowth. Its thin stems make it highly palatable and it can be ensiled as baleage or silage. When used as a forage, proper management must be exercised following stress, drought or frost as Prussic Acid poisoning can be a potential hazard. A new improved variety in which the lignin stem content has been reduced up to 40%. This sweet juicy midrib allows for greater digestibility and palatability. A wild game food sorghum suited for food plots to attract game birds. The large grain head becomes more palatable going into the fall. This is a warm season annual grass which can be harvested multiple times during the growing season as dry hay, silage or pasture. Fast growing with excellent forage quality. Persistent and productive, BG-24T is a unique, innovative blend of early and intermediate maturing diploid and tetraploid perennial ryegrass varieties. Late maturing blend of perennial ryegrasses with good winter hardiness. A late maturing tetraploid variety for silage or pasture. Bred as an endophyte-free forage perennial ryegrass. A true Italian ryegrass that won’t produce seed until the second year. Works well for a forage crop or as a cover crop due to its quick establishment and aggressive growth. A biennial ryegrass that can provide high quality forage for silage or grazing. When planted in the spring it will not produce seed heads till the second year. Usually winter hardy if planted by mid-September in most of Ontario. Requires careful management for the highest production and to keep from producing seed heads. Bred for increased palatability and high yields, very quick regrowth - highly palatable and digestible for hay and pasture applications. Does well in poorly drained and drought prone soils. Annual cover crop and plowdown for green manure. Excellent pollinator attractant. A warm season legume that requires a lot of heat to grow well for a cover crop. Also known as black-eyed peas, cow peas make an excellent addition to a summer mix with sorghum, pearl millet or sunn hemp. Inoculant is currently unavailable. Faba beans are gaining popularity in Ontario as an excellent protein source in the livestock industry. This annual legume can grow 1.5 m in height and produce yields that rival soybeans. Fall Rye can be utilized as a cover crop for wind erosion, weed suppression and the addition of organic matter. If planted early in August, Fall Rye can also be available for fall forage and a source of feed for the spring. Mainly used as a cover crop, but can be used as a forage. Winter annual with most growth occurring in the spring. May contain hard seeds that germinate 1-2 years after sowing. This annual broadleaf has a very shallow fibrous root system that creates crumbly, aggregate soil particles on the top 2 inches. A favourite of beekeepers as it will produce beautiful flowers from May to September. Phacelia will produce large amounts of biomass with little residue remaining the following spring. A quick growing annual with a deep tap root. Benefits pollinators if planted early enough to flower. Fast growing cover crop that suppresses nematodes and weeds. Outstanding nitrogen and biomass production in a short period. Killed by first frost. Needs to be planted in early July. Best to be planted with an inoculant. Also known as yellow mustard, white mustard is mainly grown in Ontario for a cover crop. Quick to germinate and can out compete weeds. Helps to control some nematodes, insects, or diseases in vegetable rotations. Does not work well if other brassicas are grown for a cash crop. White Mustard can be planted very early in spring to late summer. Must be worked into the soil for the most biofumigant effect and left to break down for 2- 3 weeks. Austrian Winter Peas are a quick establishing, cool-season annual legume with good nitrogen-fixing capabilities. Commonly used for grazing, hay and as a green manure. Yellow semi-leafless peas have a more open canopy than forage vining peas used for grain production. Contains Nitrogen fixing Rhizobia to treat 700kg of Pea Seed. An oilseed radish bred for nematode control and bio-fumigant traits. For best results it needs to be worked into the soil at bloom and allowed to breakdown for 3-5 weeks. *Radishes are heavy nitrogen users. They require manure or additional fertilizer for maximum growth. A tankard type bulb where 50% of the bulb is above the ground. Matures in 8-10 weeks. Has a high bulb yield with increased palatability, and better regrowth than purple top turnip if not grazed too short. A stubble turnip that produces a root as well as leafy top growth. Mainly used for grazing but also popular in cover crop mixes. Ready to graze in 8-10 weeks. A hybrid between turnip and kale. Has a high leaf to stem ratio. It is early maturing at 9-10 weeks. Very winter hardy. A quick establishing brassica used for forage and cover crops. Has a deep taproot and a lot of lush top growth. Ready for grazing in 10-12 weeks. A high quality, high yielding crop that can be used for deer food plots or grazing livestock in a rotational system. The large leafy tops are very nutritious and can be used to extend grazing later into the fall. Ready to graze in 12-14 weeks. A leafy perennial forage with good digestibility and high mineral content. Used in rotational grazing systems and wild game food plots. An excellent choice for a nurse crop underseeded into a hay stand. When cut at the boot stage to early heading, it will make excellent quality forage. Also planted after wheat as an economical fall cover crop.